If we’re looking for inspiration in broken times; a reminder that faith seeks understanding and inspires hope; that the living God is indeed alive. We as Westerners might first begin here. ‘The progress of Christian pilgrims has been measured in their perseverance against sin and temptation and their commitment to living out their lives within the framework of a community that cares for its neighbors and lives in hope of eternal life. 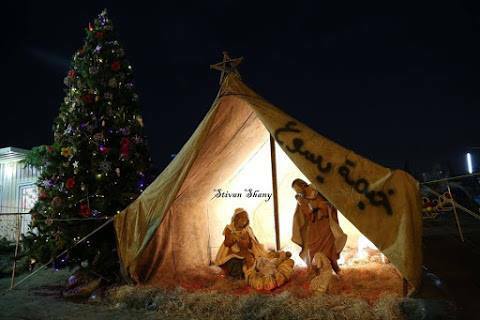 Although Elshtain isn’t, she could be taking her example from a reflection on the journey of Mary, Joseph and Jesus; to Bethlehem and then from Bethlehem to Egypt and back again. Included in this historical narrative of movement and community is the arrival of Shepherds and the later arrival of Magi from the East. Within the recollection that the diorama in the photo reveals, rests a solemn, but still joyful act of defiance and devotion. An acknowledgement that ‘God is not confined to a geographic place’. This is, as Barth might perhaps term it: a statement of gratitude, recollection and anticipation not just for the emancipation already received in Christ, but for the hope of emancipation which is to come. ‘We have learnt the art of equivocation and pretence; experience has made us suspicious of others and kept us from being truthful and open; intolerable conflicts have worn us down and even made us cynical. “Jesus Christ, as he is attested for us in Holy Scripture, is the one Word of God which we have to hear and which we have to trust and obey in life and in death. [i] Elshtain, J. 2008 Just War Against Terror: The Burden Of American Power In A Violent World Basic Books. Kindle Ed. p. 30. Well written, true, and exciting! The kingdom of God established by Jesus transcends all earthly boundaries, making true unity possible.